"Grieving is for the living. " Who said that?? I did. It seems all too often that death is a time for pain, anguish and sorrow. It should be. It should also be a time for celebration and remembrance. Sometime in our life, someone we all love, a brother, a father, and an uncle, will leave us and we will miss them. There is nothing that is going to take away the pain and sadness of missing our loved one. If you were given the chance to spend those last moments with your loved one, to watch their pulse go to zero and their body give away then you were witness to some truly wonderful actually happening. You were able to see your loved one freed. They are free for the first time in years. They are free from sin, free from worry and free from suffering. We imagine them being greeted on the other side by friends, family and loved ones who have gone before them. They are able to feast, able to eat without their teeth hurting him or choking. They are pain free and worry free and having the time of their life--er-should I say the time of their death? That is just the beginning of why we should be happy for our loved ones and celebrate their passing. Sometime this weekend, when it is nice and clear out, drive out to the country to some old dirt road where it is nice and dark. Look up to the stars. Watch a sunrise or a sunset. Marvel and awe at God's creations and how wonderful he must be to make things so beautiful. Then think of the love that you personally hold for your loved one. Now, just TRY to grasp the feeling of love that they are feeling now that they is in the presence of God. Live is a marvelous thing. I'm reminded of that every time I see my children. Creation is a wonderful gift from God. But don't be confused and think that as he gave us life when he created us that he destroys us when he gives us Death. No, in fact, death is another gift he gives us. He sacrificed himself so that we may conquer sin and spend eternity with him. Imagine---eternity in the presence and love of God. What a is truly in a wonderful place we will be in and that are loved one is in now. There is a theory in forensic science called the "transfer theory". It means that wherever we go, we leave a bit ourselves. We leave hair, dirt, threads, cells. I believe that whenever we come into contact with someone we leave a little bit of ourselves behind---positive or negative. I know my loved ones have left some of their personality behind in me. I see traits of them in me. Their wonderful wit and sense humor. Their mild nature. His enjoyment of the Beatles. 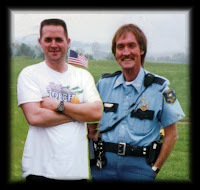 One of the reasons I chose law enforcement was because of my Uncle Mick. So my loved ones have left a bit of themselves behind in me and I'm sure you can see in you some of what your loved ones left behind. Whoever my Uncle Mick left his enjoyment for Schlitz and cranberry sauce to---I feel sorry for. I know we are in pain. But in our pain, be happy for our loved ones and remember them. Celebrate their life and their passing. As long as we have memories they will still be with us. As long as we have the communion of saints, they are still next to us. I wrote this several years ago as a post on my families website at myfamily.com after my Uncle Mick passed away at 54 years old. He was the Chief of Police in the small town where I grew up and left behind two daughters, Amy and Megan. I decided to pull this out of the archives of the family website and edit it to make it available to the blogosphere.